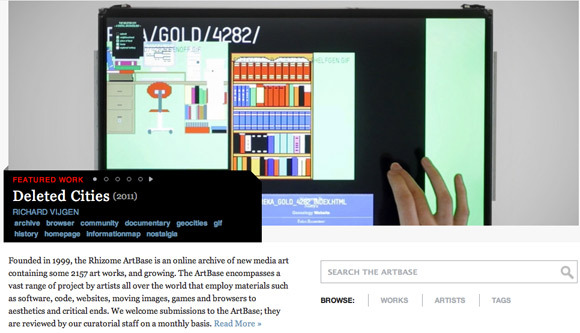 Rhizome is happy to announce that we have launched a new design and a big new feature for The ArtBase. In case you are not familliar with the ArtBase, it is Rhizome's archive of internet art and new media, contains over 2,000 works of art, and spans nearly two decades of history. Facing such vast size and complexity, and seeing a lack of major archives of internet art and new media that are accessible to a general audience, a major goal of ours was to afford greater to the history and context of these works, as well as improved searchability and browseability. To address the issue of education, accessability, and context we have accessibility launched a new feature: collections. Just as a museum may provide access to their catalog through historic or thematic groupings, the ArtBase collections seek to surface trends, themes, and creative modes inherent in our collection. 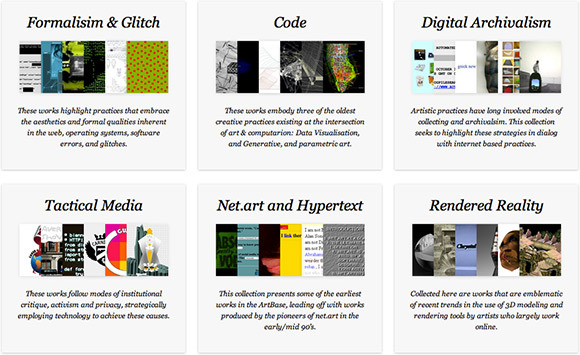 We are launching this feature with six initial collections: Formalism & Glitch, Code, Net.art & Hypertext, Tactical Media, Rendered Reality, and Digital Archivalism. Each collection leads off with a curatorial statement, aiming to provide context for the viewer who may not be familiar with the history of these creative practices. The content of the collections is not static, and will grow and change with the evolution of the ArtBase. As well, while these initial six collections were curated by Rhizome, subsequent collections will be curated and driven by indipendent curators and scholars. Moving forward, we have two big projects on our to-do list for the summer. First, we are in the initial stages of migrating the back-end of the ArtBase to a new collections management platform, which will allow us to catalog works with better metadata standards, and correlate works, artists, collectives, exhibitions in ways that we currently can not. Secondly, we are embarking on a major web archiving initiative. Nearly half of the works in the ArtBase are not maintained within our digital repository, placing these works at great risk of link rot. Using tools such as wget, HTTrack, Heritrix, Beautiful Soup, and Scrapy, we will be crawling these works so that we may better preserve and provide access to the history of online artistic practices.